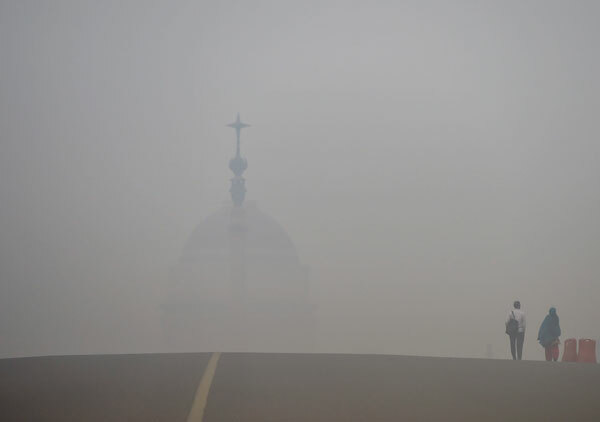 PTI, NEW DELHI: Delhi's air quality worsened through the day and went off the charts by the evening as the city recorded its worst quality air of the year the morning after Diwali, authorities said Thursday. The air quality index (AQI) was recorded at "severe-plus emergency" category due to rampant bursting of toxic firecrackers, they said. In gross violation of a Supreme Court order, people in several cities burst firecrackers until at least midnight, two hours after the 10 pm deadline. Loud bangs rent the air in New Delhi. Violations were also recorded in Mumbai, Kolkata, Jaipur and other major cities. Partly as a result of smoke from the firecrackers, the overall AQI in Delhi jumped to 642 which falls in the "severe-plus emergency" category, according to data by the Centre-run SAFAR (System of Air Quality and Weather Forecasting And Research). "The Delhi Air Quality Index is 500+ at present. Early morning at 1 am, smoke layer became thick and started to trap pollutants near the surface rapidly. However, air quality is recovering from the afternoon and is likely to touch 'very poor' range by night provided no additional local emissions are added anymore," it said in its report. The contribution of PM2.5 and PM10 had increased from 50 per cent to 70 per cent last night, indicating an increased share of locally generated firecracker emissions, the SAFAR said. On Thursday, the PM2.5 (particles in the air with a diameter of less than 2.5 micrometres) level was recorded at 492 µgm-3, more than eight times the permissable limit. The PM10 (particles in the air with a diameter of less than 10 micrometres) level was recorded at six times the permissable limit at 618 µgm-3, according to the SAFAR. India's official permissible PM2.5 limit is 60 µgm-3, while that of PM10 level is 100 µgm-3.